Dadje Samuel (left in photo), a Grace Brethren Chadian evangelist and evangelist trainer, sends a report on a recent training he conducted. With him are Joseph (in bicycle) and Pascal. Veteran missionary Larry DeArmey and Grace Brethren International Missions board member Keith Shearer will travel to Chad in January for three weeks to teach in Samuel’s school, to speak at the national conference of Grace Brethren churches, and to teach at the Bible Institute in Chad. I thank you for your prayers on behalf of the ministry in Chad. God answers your prayers every day. From October 20 to October 25, I led a seminar for 10 pastors who are now finishing a Bible School program taught in the local dialect. I taught them how churches must remove animism and tradition from culture. The reason for this teaching is that our churches do not understand the difference and this is an illness that is killing churches today. Thanks be to God that eight out of the ten asked forgiveness of God and committed themselves to bring a new dynamic to their churches. From October 24 until November 4 we trained 21 leaders and 16 of them asked forgiveness of God. Among them was a paralyzed man who is also a church-planter. 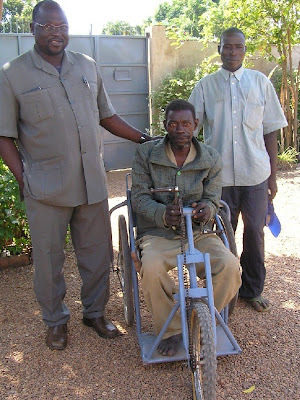 The other leaders collected money and we added to it in order to buy him a three-wheeled bicycle (see photo). Joseph is now committed to doing evangelism. Pray for my wife who is, along with her team, training 18 ladies at Yola in Nigeria. Twelve ladies will have received their diploma. My wife is teaching in a large Brethren church that has 120 believers attending. I am on a break, waiting for my wife to return, and then I will travel to Cameroon from the 13th to the 24th of November with the professor Bereou Samuel. This will be the fourth on-site training summer school training session for these leaders. Among these leaders are 11 who are involved in church-planting. Pray for my family and for me. I want to say thank you to you for your support which permits the training of leaders in Africa. I do not merit this support but you are doing it for God. May His name be praised through Jesus.